"YOUR BEST MEDICINE FOR WORK DAY BLUES AND CITY STRESS? TRY WOODS & WATER! Are you ready for your own summer escape and winter wonderland! 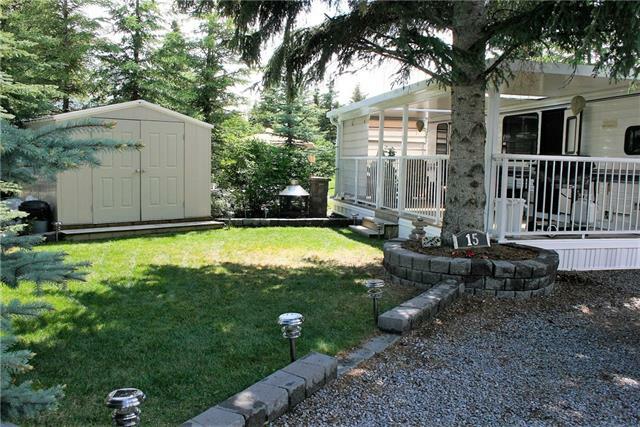 A beautiful RV lot set among towering spruce and close to the Red Deer River with a picturesque and spacious holiday trailer already in place, complete with a covered canopied deck and guest cabin! There is even a fireplace in the trailer for those blustery days! This is your perfect prescription to shake off your work day worries. Situated in Sundre on the banks of the Red Deer River, Tall Timber Leisure Park is a gated cottage community with seasonal services and year round access to showers/laundry, and playgrounds all within the park! Keep the Doctor away by Exercising daily in the Heated Indoor pool, relax in the hot tub and spend the day fishing the river or golfing one of the three local courses! With all this, you will want to start your prescription immediately. Call today for your personal consultation!!"